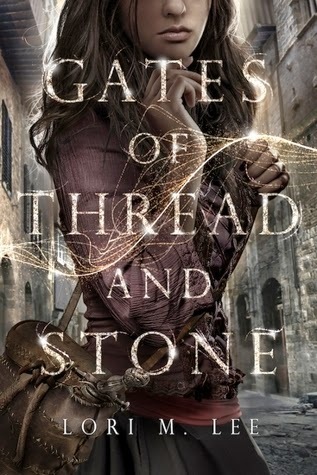 "In a city of walls and secrets, where only one man is supposed to possess magic, seventeen-year-old Kai struggles to keep hidden her own secret—she can manipulate the threads of time. When Kai was eight, she was found by Reev on the riverbank, and her “brother” has taken care of her ever since. Kai doesn’t know where her ability comes from—or where shecame from. All that matters is that she and Reev stay together, and maybe one day move out of the freight container they call home, away from the metal walls of the Labyrinth. Kai’s only friend is Avan, the shopkeeper’s son with the scandalous reputation that both frightens and intrigues her. Then Reev disappears. When keeping silent and safe means losing him forever, Kai vows to do whatever it takes to find him. She will leave the only home she’s ever known and risk getting caught up in a revolution centuries in the making. But to save Reev, Kai must unravel the threads of her past and face shocking truths about her brother, her friendship with Avan, and her unique power." The wonders you find when just randomly browsing Goodreads! How awesome does this sound? And check out that cover! Definitely one on the wish list! I really enjoyed this story, your heart goes out to Kai and her devotion to her adopted brother, and her devastation at his disappearance. She was determined to save him no matter the risk to herself. Kai tries to be strong but she really needs those around her to give her strength. At the end of the book it certainly left me wanting to find out how she continues her journey.